One candidate will be chosen by our Chapter Scholarship Committee to receive the Ralph E. Chamberlain Scholarship for the 2019 AFP International Conference. The award will cover conference registration fees, minus a $10 processing fee. 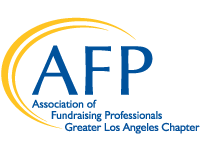 In addition, this year’s Chamberlain Scholarship winner will be reimbursed up to $1,000 by our AFP-Greater Los Angeles Chapter. These additional funds are to be used toward travel and lodging expenses only. Expenses in excess of these two scholarships will be the responsibility of the scholarship winner. Chamberlain Scholars are responsible for registering themselves for the conference and for making all travel and lodging arrangements. The AFP Foundation for Philanthropy sponsors the Chamberlain Scholarship Program to help individuals serving nonprofit organizations to develop their knowledge and skill in fundraising. The scholarship honors the memory of Ralph E. Chamberlain, CFRE. AFP Chapters may name only one grant recipient per year. Applications must be submitted to: Jeanne Warlick at JWarlick@materdolorosa.org or by Fax at 626.355.0485.